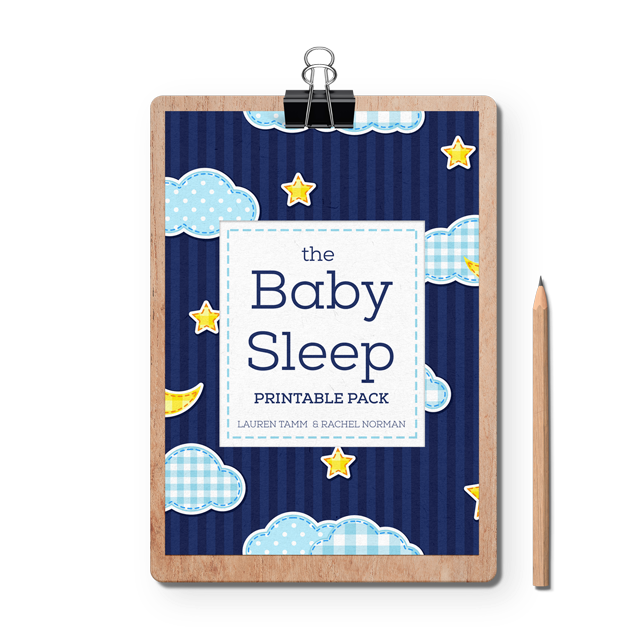 Keep your child’s morning, bedtime, playtime, mealtime and chore routines simple, easy and free from power struggles! 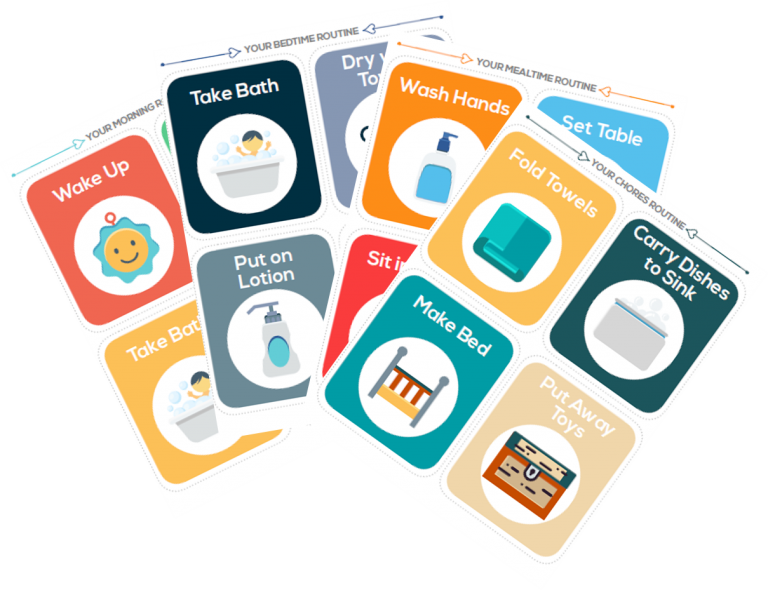 Print these visual routine cards to help your child follow the routine without yelling, nagging or reminding. 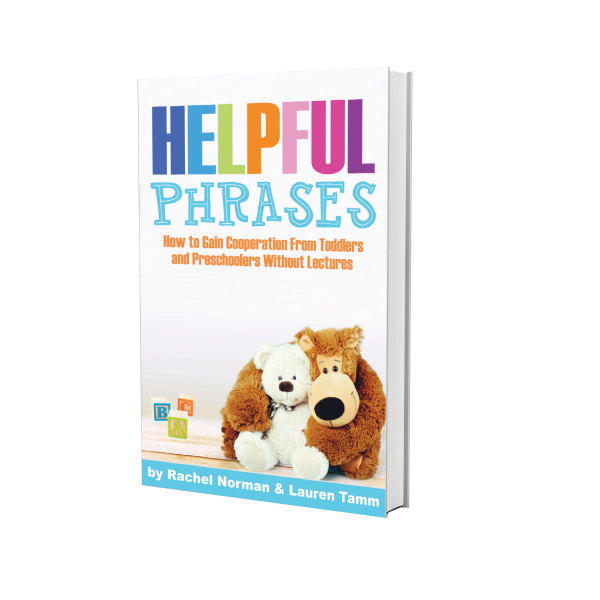 Help keep your child’s morning, bedtime, playtime, mealtime and chore routines simple, easy and free from power struggles! 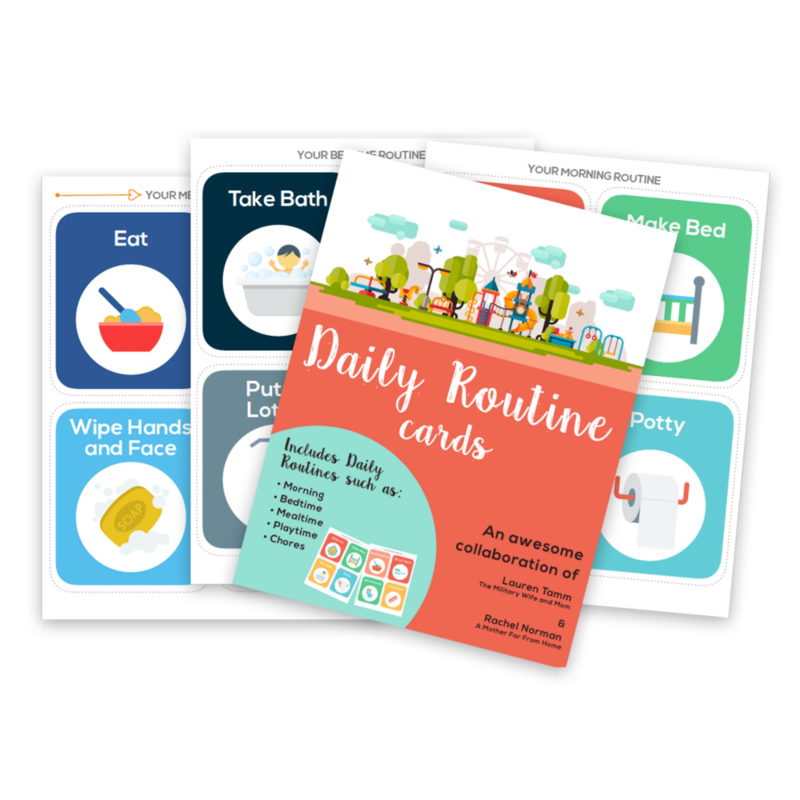 Print these 40+ visual routine cards to help your child follow the basic daily routines without yelling, nagging or reminding. 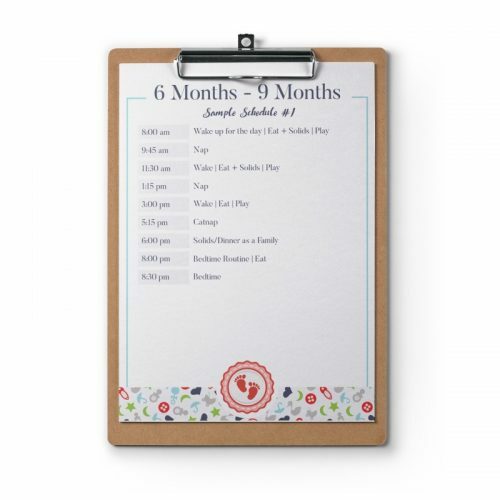 The routine cards can be printed out on cardstock or printer paper then laminated for ease of hanging and durability. You can rearrange in any order that suits your own family’s needs. These printed out beautifully. Exactly as pictured. I can’t believe how much my 3 year old loves them. She is already started to remember the pictures and doing the next step of her routine without reminders! I would absolutely buy an expansion pack with more chores for when she gets older f you ever make one! Love these but what are your suggestions for how to use them? i.e. once he completes a chore or process, …. affix them to a board of some kind? Looking for ideas…. These made a HUGE difference in like one day. This morning she pumped her fist and said, “the last one is ‘comb hair! '” before she came into the bathroom and started brushing her own hair. 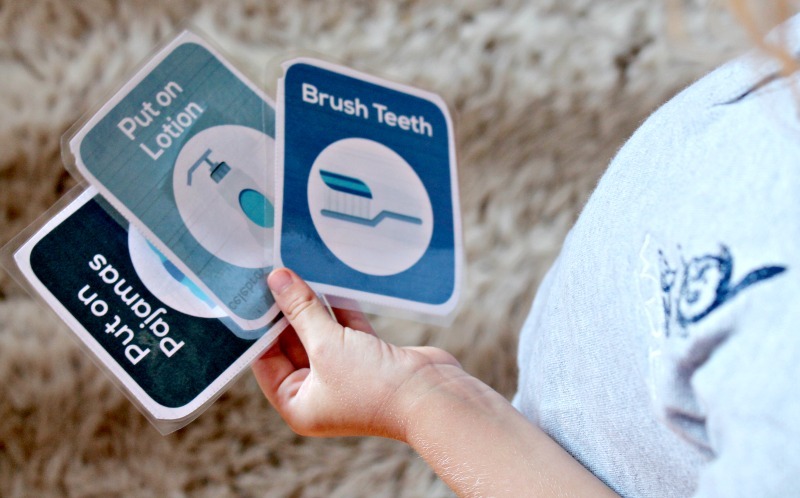 I truly love these and think any toddler mom could benefit! I am so excited to try this! It is exactly what I was looking for. I love the positive approach to parenting. Thank you! The routine cards are life changing! 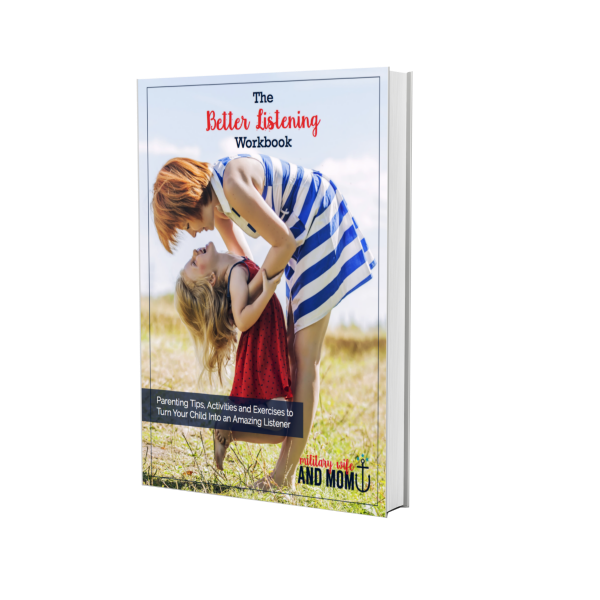 My son has ADHD and our mornings and bedtimes were brutal on both of us and often ended in him feeling bad about himself and me feeling guilty for not knowing how to help him to be more successful and me to be more patient. Well these cards were the answer for us. He feels more independent and accomplished and I don’t have to nag him or feel as frustrated. It’s a win win for us! A tip for anyone who has two levels, we have two boards, one with the things he does upstairs and one with the things he does downstairs. 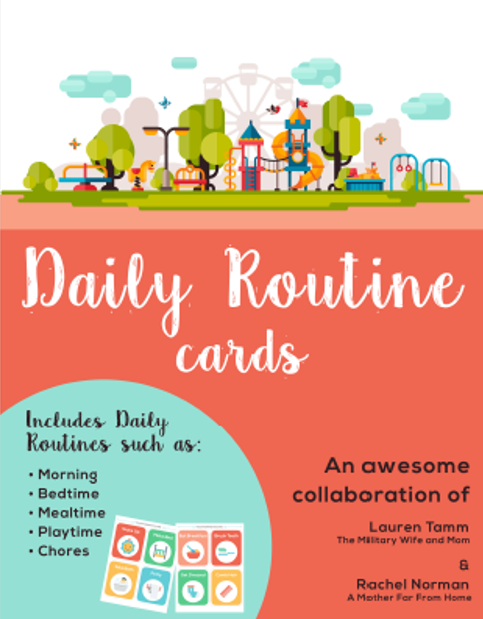 Absolutely love these routine cards, and the chore cards. How about a set for moms?! Like all the bathroom items (clean toilet, mop floors, scrub tub), kitchen items (clean over, mop floor, wipe fridge), vacuum living room, vacuum mattress etc! I’m always trying to get these things done, it would be great to grab a card or two each night to keep me on track so I’m not always trying to do these things on the weekend. Yes! There is now shower, bath, toilet, potty, brush, comb, pack bag, unpack bag, take off shoes. An editable template is included so you can edit and create your very own custom cards in a few minutes time using either Mac Pages or Microsoft Word. And there is also a set of cards with only pictures and no words, so you can write in your own words too! Hope this helps! These cards are fantastic! My 2.5 year old son is totally on board, which is wonderful! I had an issue downloading them after purchase, and Lauren sent me the files immediately, no questions asked. She’s been above an beyond helpful. A++++++ all around!!! Fantastic, Awesome, Wonderful!!! These cards have helped me to organise two little girls and no more endless questions and boring directions on what they need to do next. Have made the daily routine a breeze! THANKS!!!! The template defaults to Arial font, which is the same as the original set. Hope that helps! Hi,this looks great, will definitely try, I was wondering if you use an specific photo paper to print them? We use card stock and matte photo paper. Any variety seems to work well. We’ve printed ours multiple times. If you want to increase the life of your printed cards, you can use some simple laminating sheets, and they’re instantly more durable. Aaah thank you!! 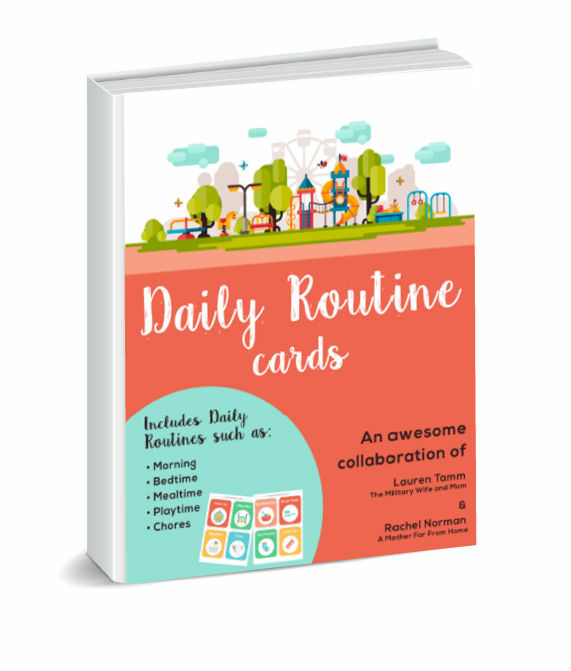 These routine cards have definitely stopped power struggles when it comes to the evening routine. My little 20month old hates being dried after bath time, and changed into pyjamas. It was a constant battle for many months and i was getting so tired and frustrated. 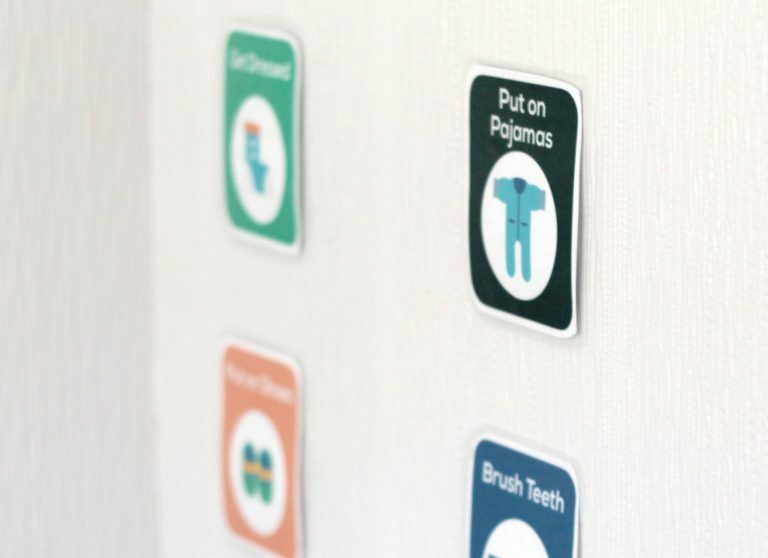 Printing these routine cards and sticking them up on the wall in the bathroom he was really excited to point to the next card to tell me what comes next. Voila!! he was excited about the evening routine! Hallelujah. He is even calm enough to sit through moisturising and will do it himself too. Thanks! And the cards are so visually nice too. These cards are great. I’ve got a child who struggles to go to sleep by himself. Got the cards just for something to try. They work like a hot damn. No coaxing, no whining. Just sleep. The only feedback I would give is that the cards in the Word editable file are not the same size as the ones in the PDF. For anyone as OCD as I am these are the edits I made: the colour box sizes are 10.3 x 8.8cm. The borders are 11.1 x 9.5cm, grey, round dot, 2.5 pt. The rounded corners need a slightly smaller radius. The center circles are 6.5 x 6.5 cm. The font in the title is called Nexa Bold and can be downloaded for free online. These are great! My son got most of the pictures faster then I thought, and some he’s changed the meaning of to be meaningful to him. (For example, the heart for the prayers card he calls give/share love with the family). I like have some I can customize for our family too. (We have five cats and a tortoise to feed, we feed the birds, etc.) We recently started working with an OT and using something like this was her first recommendation for helping with transitions. Thank you so much! Just downloaded these and they are exactly what I have been looking for! They are beautifully made and perfect for my 3 year old. Thank you, thank you!